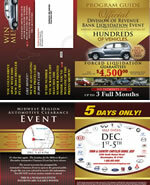 When it comes to automotive direct mail, you only have one chance to grab the recipients attention. 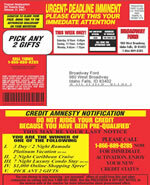 Poorly designed mail pieces are typically discarded as junkmail without ever being looked at. Unlike other automotive direct mail companies, Big Time Promos always ensures that your mail piece is designed to perfection. We have been where you are now and completely understand the ins and outs of your business and know what it takes to be successful with automotive direct mail marketing. 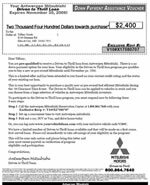 Our direct mail promotions are tailored for each dealer, regardless of size, and our mail lists consist of the most targeted recipients available. Automotive advertising and marketing is a challenging task and it takes an experienced company to deliver quality results. 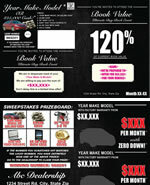 We aren't your typical mail house, we specialize in automotive direct mail! 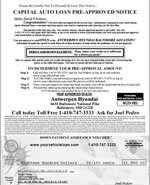 We encourage you to browse below at our various types of mailers and contact us today for a custom quote. Some examples of the types of mail we can do are: event mailers, 4 color tri-folds or bi-folds, 4x6,9x12,11x14, or 12x15 postcards, 11 x 17 tri-fold, saturation mailers, 17x22 quad-fold mailers, 8 page booklets, key mailers, scratch-off mailers, credit card mailers, giveaways, and so much more. 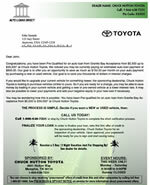 Pre-Approval mailers are an excellent marketing solution for capturing subprime leads. Pre-approvals are targeted to a specific credit range and income requirements and include a firm offer of credit and includes variable data. 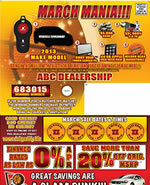 The main focus on our beacon driven mailers is the sub-prime and prime credit weighed against an almost paid out auto. Someone with an old car with a few thousand dollars left to pay on it and 550 - 680 credit score will be more likely to get financed. That’s because they will have no, or very little, negative equity as opposed to someone with just a sub-prime score and 4 years left to pay on their car. This sale has been designed and set up by one of the BEST finance managers in the country. 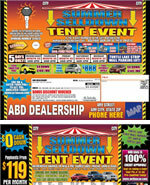 You will get a response off our mailer (all our dealers do) and you will make great grosses (all our dealers do). The Credit mailer campaigns hits with the right hook and it just works. 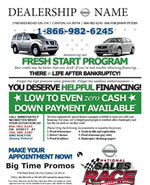 You’ll have people that want and need a car and will come in and work out a deal because their car loans are almost up. 1st step is deciding how many pieces you’d like to do, what day you want them in the mailboxes, and which premium, if any, you’d like to use. 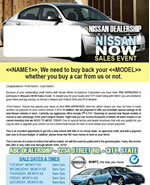 I need the name and physical address of the dealership and whose email we can use to send the calls to. I will then write everything up and fax it over to be signed off on and it will go into the production process for your approval on the piece before we print. Once we print and payment is received your mail goes out and I come back into the picture with your username and password and phone scripts to start to prepare you for your sale. You will have 24/7 access to me, as I am always available to my dealers for any help that is needed. No matter the amount, whether it’s 5,000 pieces or well over a million, we can help you succeed! Just let me know what you need and what you’re looking for and we can put it together. 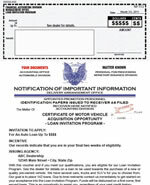 8.5 x 14 inserted into a #10 window envelope. 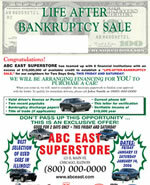 Our Bankruptcy Mailers are targeted to currently discharged bankruptcies. 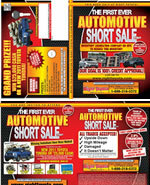 These are a very popular mailer and are usually done every 90 days. 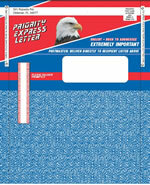 These mailers are completely customizable and they are mailed in a #10 brown envelope. The average response rate is 1% - 2%. Our lists are updated DAILY. 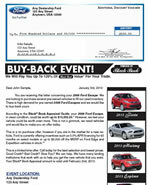 Buy Back Mailers offer dealers data driven targeted leads. We will design a custom mail piece to target your needs. 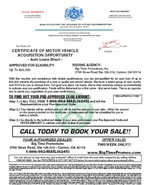 With our lists you can target specific customers with offers for their current vehicle. 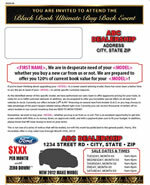 The mailer invites them to your dealership by letting them know you are interested in their vehicle. 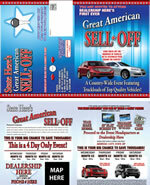 Buy Back Mailers include variable year, make, model, and values. 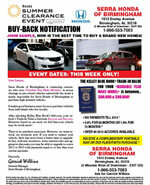 The Buy Back Mailer gets up to a 90% open rate. Mailed to 580 to 680 beacon score. 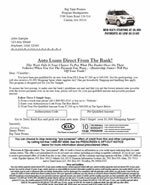 auto loan that’s 80 to 99% paid, $2000 month minimum income, minimum two year credit file with no derogatory information in the last 6 months. 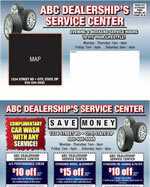 2-11x17 on 100# Matte, Half Fold, Affix Scratch off, Variable on Page 1,2,7,8, Standard Ground Shipping. 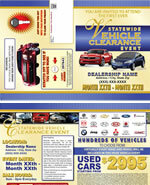 8.5 x 11 on 60# Stock with Variable, Folded and inserted into a #10 Window Envelope, Standard Ground Shipping. 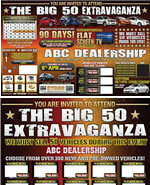 11x17 on 100# Matte Text with Variable, Bi Fold, Scratch off, Standard Ground Shipping. 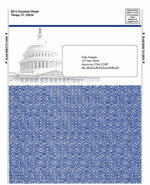 8.5x11 printed on 60# Stock, Variable, inserted in #10 Window Envelope, Standard Ground Shipping. 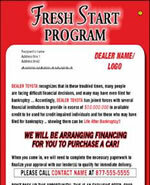 Can be used with Dealer List. 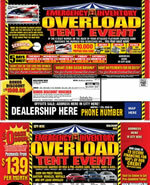 We have a huge variety of Event Mailers that are available as an 8 page booklets or 4 page booklets, Our Event Mailers come in full color, continues to be the prime in driving traffic to dealerships and allows you to stylishly showcase your inventory. These mailers come with scratch offs and with our without a key. 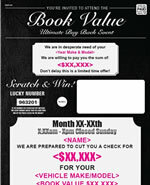 8 Page Booklet: 2-11x17 Pages Half Folded, 100#, Saddle Stitched, Circle Scratch off, With or Without True Cut Key, Occupant Resident List with Standard Postage. We offer a variety of postcards. Sizes range form 4x6 – 12x15. 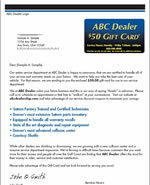 Postcard mailers can be sent to a customer supplied list or a zip code radius list. Postcard mailers can be sent out 1st class which has proven better results. 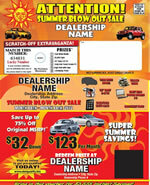 Postcard mailers are a great mailer at a low cost. 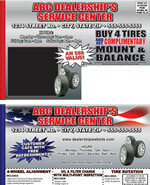 12x15 Postcard on 100# Gloss, Circle Scratch off, Occupant Resident List with Standard Ground Shipping. 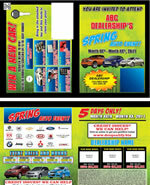 9x12 Postcard on 100# Gloss, Circle Scratch off, Affix True Cut Key, Occupant Resident List with Standard Ground Shipping. 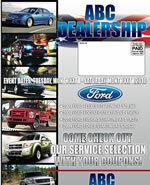 12x15 Postcard on 100# Cover Gloss, Scratch off, Occupant Resident List with Standard Ground Shipping. This is the MEGA MAILER! 22.75x35 Postcard printed on 100# gloss with Scratch off. Folds to an 8.5x11. 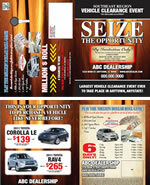 Key or Credit Card can be used on this mailer. 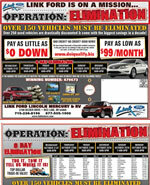 If you need bang with your promotion, service mailers are what you need. 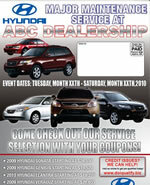 With our service mailers you absorb all your promotions in one place. 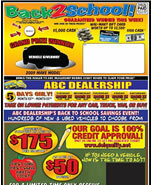 Service mailers allow you to promote your new or used car deals while offering the customer additional savings through the service department with coupons. 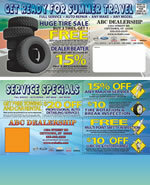 Our service mailers come in a variety of designs, sizes and can be mailed to your owner body. 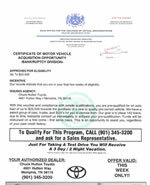 11x17 on 100# Gloss Text, Tri fold, Glued, occupant resident list with standard ground shipping. 5.5x11 Postcard on 100# Cover Gloss, Occupant Resident List Saturation Postage with Standard Ground Shipping. 5.5x8.5 Postcard on 100# Cover Gloss, Occupant Resident List Saturation Postage with Standard Ground Shipping. 6x9 Postcard on 100# Cover Gloss, Occupant Resident List, Saturation Postage with Standard Ground Shipping. 8.5 x 11 with a service credit card for database list. 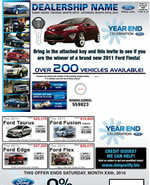 We have a large variety of any seasonal mailers. Just to name a few are: New Years, Tax Time, Presidents Day, March Madness, Spring Clearance, Summer Savings, 4th of July, Labor Day, Thanksgiving, Black Friday, and Christmas. 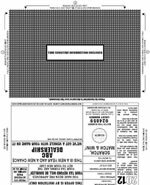 11x17 with or without True Cut Key on 100 # Gloss, Taped, Circle Scratch off, Occupant Resident List with Standard Ground Shipping. 8 Page Booklet: 2-11x17 Pages Half Folded, 100#, with or without True Cut Key Saddle Stitched, Circle Scratch off, Occupant Resident List with Standard Postage. 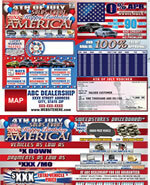 17x22 on 70# Gloss, Quarter Fold, Scratch-off, Occupant Resident List with Standard Ground Shipping. 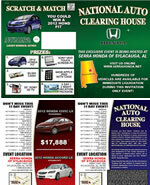 11x17 on 100# Gloss, Tri Fold, Circle Scratch off, Occupant Resident List with Standard Ground Shipping.